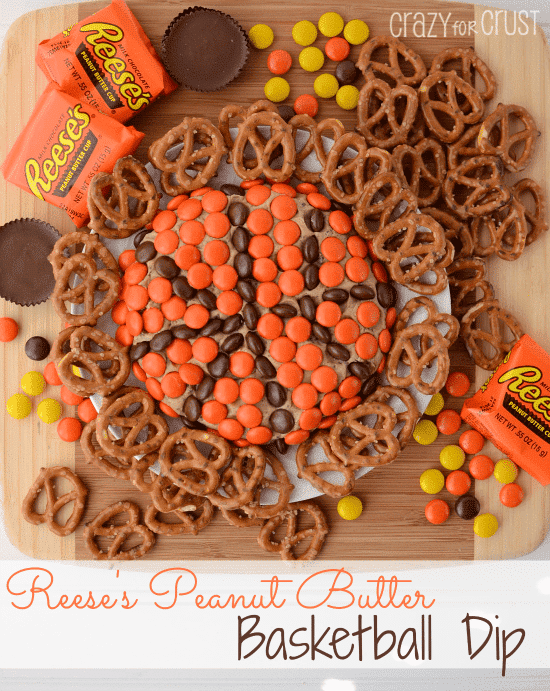 This Reese’s Basketball Dip is perfect if you need a sweet treat for a basketball party! A sweet peanut buttery dip made with Reese’s Peanut Butter Cups AND Reese’s Pieces, this Reese’s Basketball Dip will wow your friends and family! I’m not a huge basketball person, but it was always my favorite sport to play in high school gym. Why? I have no idea. It involved running, balls, and sweating, three things I’m deathly afraid of and would prefer to avoid at all costs. But every rainy day I looked forward to the basketball time. Maybe because I was good at playing HORSE? 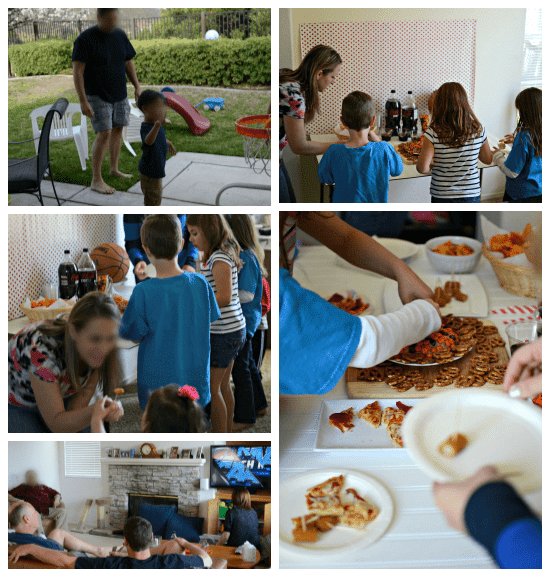 We all know I’m not a huge fan of watching sports – but I am a huge fan of throwing a party. Give me a theme and I’ll run with it! When I got the opportunity through my work with Collective Bias to throw a party for the college basketball tournaments that are on right now, I was excited. I mean, it’s a reason to get all cutesy with food! I shopped for my party staples at Walgreens. They have everything you need for a Grab and Go party. Stop on your way home from work and you’ll have everything you need! You can check out my shopping experience in my Google+ album. Jordan helped with the shopping, something she took very seriously! Soda is a must at a party, if you ask me. 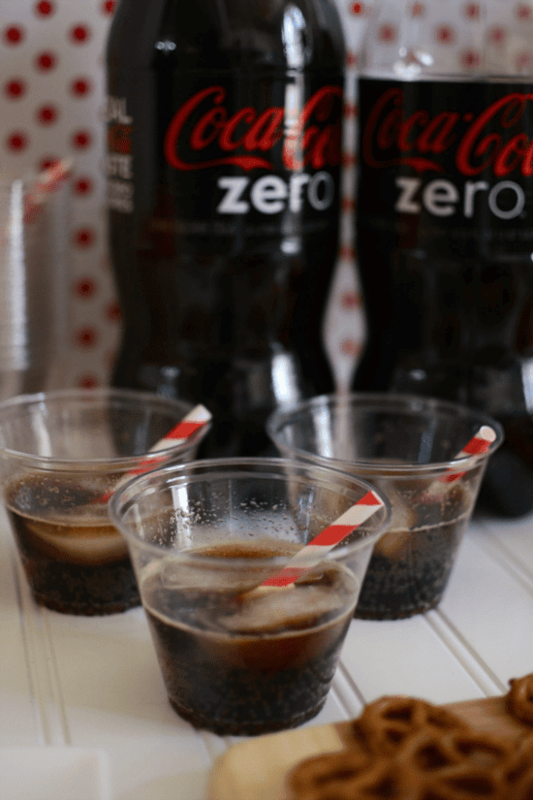 I’ve loved Coke Zero since it first came out. It doesn’t taste like diet soda, which is a huge deal for me. Fake taste = YUCK. 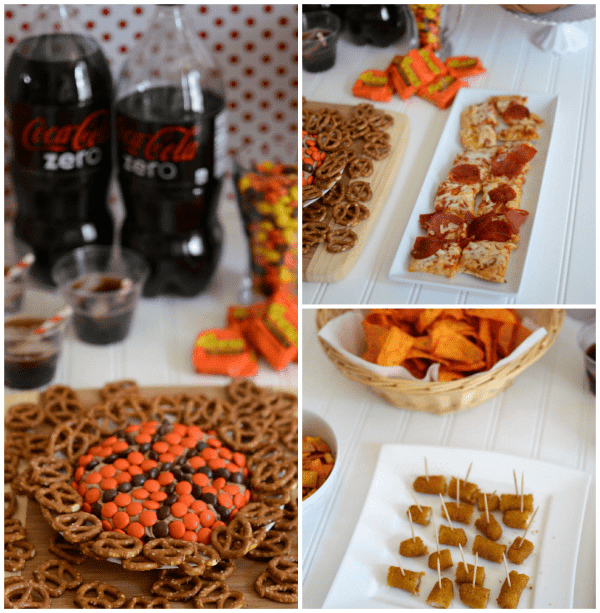 Coke Zero has none of that fake taste, so I stocked up on some for our basketball party! Since Jordan was with me on my shopping trip, we came home with Doritos and Cheddar Chex Mix. We could both eat our weight in those! Walgreens also has an ample frozen food section – pizzas and even frozen appetizers like mozarella sticks. Jordan didn’t know what a mozzarella stick was. Poor girl is sheltered. I remember mozarella sticks fondly from my college days living at eating at TGIFridays. Remember those, anyone? And well, Reese’s Candy. The star of my party, if you ask me. Peanut butter + Chocolate = the BEST COMBO EVER! As soon as I knew Reese’s was part of this campaign, I knew exactly what I was going to make. Reese’s Basketball Dip. A few years ago I made a Peanut Butter Football Dip that is still my most viewed recipe. I’ve been wanting to do another shaped dip forever and this was the perfect opportunity! 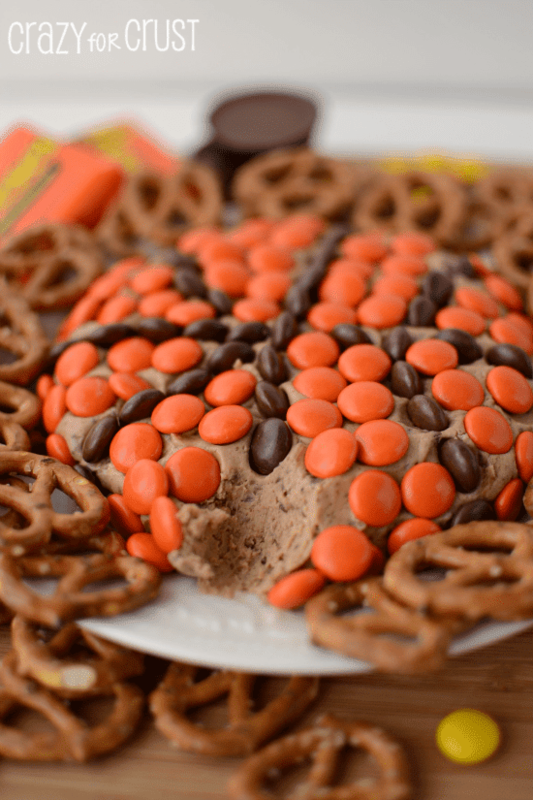 This Reese’s Basketball Dip is made with Reese’s Peanut Butter Cups. No, seriously! I ground up the cups and mixed them with cream cheese, a little peanut butter, and powdered sugar for binding. It came together quick and is like eating a huge peanut butter cup. To. Die. For. 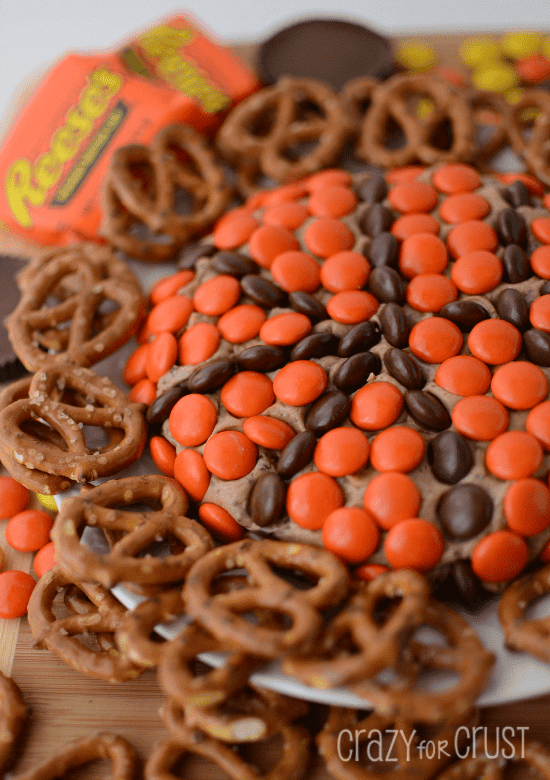 Seriously, a Reese’s Basketball Dip. You want this in your life, trust me. The kids loved the snacks. The men loved the sports. It’s kind of how a usual party goes, right? I say food, they all come running! But we all loved the Reese’s Basketball Dip. How could you not? 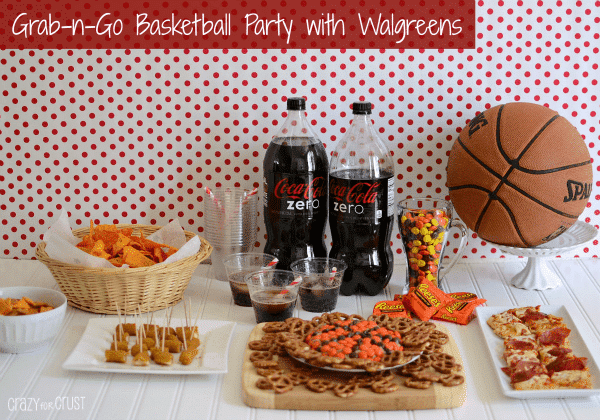 If you need a sweet treat for a basketball party, this dip is the one for you! A sweet peanut buttery dip made with Reese's Peanut Butter Cups AND Reese's Pieces, this Reese's Basketball Dip will wow your friends and family! Finely chop Reese’s Peanut Butter Cups in a food processor. Add to a medium bowl along with the cream cheese and peanut butter. Mix with a hand mixer until completely combined. Beat in the powdered sugar. Scoop your dip onto a serving plate. Spray your hands with cooking spray to avoid sticking, and form the dip into a round basketball shape. Separate the orange and brown Reese’s Pieces from your package. Cover the dip in the orange, and use the brown for the stripes on the ball. Store in refrigerator, bring to room temperature before serving. If you need any last minute things for your basketball gatherings this week, stop by Walgreens. They have everything you need to Grab and Go! What’s your favorite party food? I am a member of the Collective Bias® Social Fabric® Community. This shop has been compensated as part of a social shopper insights study for Collective Bias® and Walgreens. #cbias #SocialFabric” All opinions are 100% my own. I want to try this! 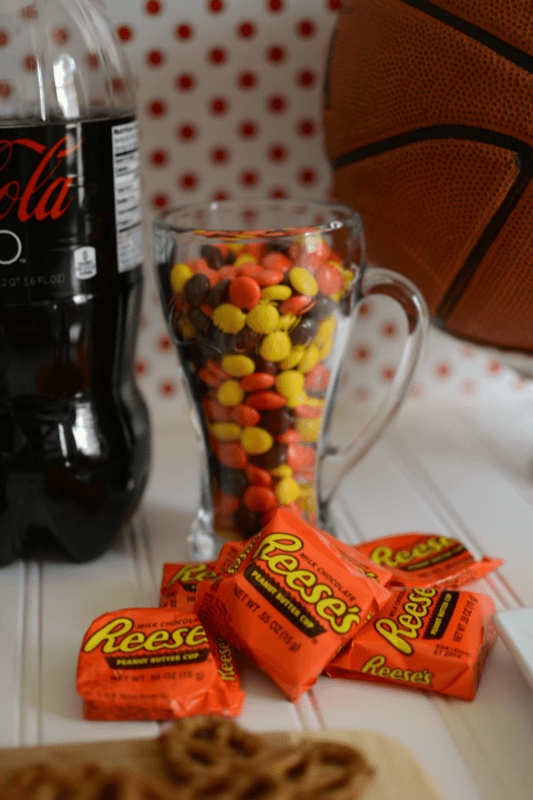 I love reeses…and basketball! This is one of the most beautiful sweets I’ve ever seen!